Have you ever noticed that the ground at a beach has rocks of many different sizes? These rocks, sand, and dirt are all called substrates. The types of substrate we see are described by the size of the particles that cover the ground. These can range from large boulders down to fine grains of sand and dirt, with many sizes in between. No matter what type of substrate you see at the beach, you can find organisms that will live in or on it. Just like there are different types of substrates, there are different types of organisms that can live there. How can we determine which types of organisms prefer which types of substrates? That is the job of field researchers! Students collecting mollusk data on different beach substrates. 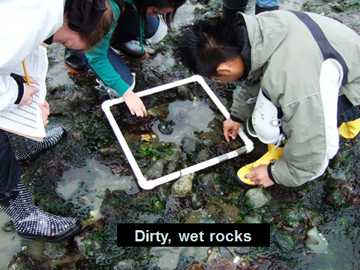 Students and teachers at Kentridge High School have made many field trips to the beach and have seen lots of organisms. Normally, they just noticed what they could see easily in front of them. Students became interested to know how the type of substrate influences which organisms will live there. They noticed that the snails in the aquarium at school like to stick to the glass walls of the tank. Do snails and other shelled mollusks found near the ocean, like chitons, periwinkles, whelks and limpets, also like to live on large, stable substrates? The students went to beach to find out! Mollusks have a “foot” which may be able to attach more securely to larger substrates, such as boulders, and allow them more room to move. So, the students expected to find more mollusks on boulders than on other types of substrates. To gather the data needed to answer this question, the students went to a local beach. They looked at sections of the beach with substrates of all types. On these different substrates, they kept track of all the different types of organisms that were present. They measured the frequency that they observed four types of mollusks (chitons, limpets, whelks, and periwinkles) on the following substrates: boulder, gravel, pebble, logs, sand, and shell debris. Frequency was measured as the proportion of times that a particular organism was present on a substrate type, out of the total number of observations. For example, if they observed 2 boulders and saw limpets on 1, the frequency would = ½ or 0.5. For more information on the Seattle Aquarium’s citizen science project, and to download the dataset from this project, click here.